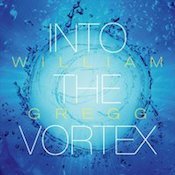 My initial impression of William Gregg’s Into the Vortex is that the artist has decided to try to blend baroque music with electronics, a sort of Well Tempered Clavier on the synth or a new-ish take on Switched On Bach. There are jaunty-yet-regimented pieces that feel like they’d sound right at home on a harpsichord—and perhaps slightly less so in my ears. It can be charming, and my reaction to it may tend to be more dependent on my mood than I’d like to admit. The opening track may be to blame for my initial reaction; it starts quietly and with a genteel feel, but about a minute and half in, Gregg loads it with high, sharp tones that start poking me in my mind’s eye. The idea works better on “Elevation in G Major.” On this track the obvious baroque influence gets matched with keyboard runs lifted straight off a 70s rock album. (I’m getting images of “Fooling Yourself” by Styx, but I’m just that old.) There’s another side to the equation on In the Vortex, one that works better for me. Soft-edged, thoughtful pieces such as “Opening Mind” and “Elements” offer a less frenetic and, in my opinion, better executed listen. These pieces sound less forced. Gregg is able to layer his textures in and take advantage of their differences. The disciplined structure of the keyboards works better slowed down and paired with the pads and washes, and this also helps to highlight the beauty of the melodies. I do not particularly enjoy Into the Vortex as a straight-through listen. I can only take so much of the electro-baroque idea in a sitting. Its charm and energy is more welcome when it pops up in a mix; track after track, the welcome gets worn. The quieter pieces more readily stand on their own, and showcase Gregg’s range. Over the course of the three albums I’ve reviewed, he has shown that he is interested in pushing his boundaries and finding new expressions. Although this one does not work as well for me as previous outings, it’s still worth a listen.